This battle is one of the moderatly difficult, especially because Mr. Fantastic is a rather weak character and he's alone against two rather strong enemies. Dr. Doom will act before his Doombot, attacking Reed and giving him an extra turn due to his Tactician class bonus: attack Dr. Doom with Stretch Punch dealing Distraction to him (his Magic Bolt could be lethal). Fantastic should then use L9 Bifurcator on the Doombot to make him attack his master for a turn (the real Doom will then attack him with 1 Red Ring Imperial). 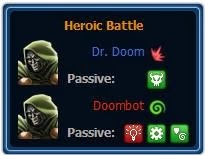 When Dr. Doom gained Refocused attack him with is L2. If it gained Red Weak Point instead due the Mr. Fantastic passive use his L3, but don't forget to use Bifurcator when is unlocked. This battle is easier than it seems. Moonstone is a Tactician, so she's got a class advantage against Ms. Marvel (unless you've bought her Bruiser alternate outfit), but all of her attacks aren't really powerful, and some of them are energy based. Just use Absorb Energy to get healed by Moonstone's energy attacks, use Kree Speed and attack her with both Brawl and Photon Blast, empowered by the Green Electromagnetic Energy and Green Kinetic Energy buffs. Stamina won't be a problem, since Ms. Marvel Green Hidden Potential will make her regain stamina from energy attacks. This battle could be quite difficult, due to Bowman's class advantage and the fact that Hawkeye is alone against 3 enemies; it'll be best bring an hero with his Tactician Heroic Age alternate outfit. The first thing to do is marking one of the Pyros with Pinpoint Target, and attacking him, dealing all enemies a damage-over-time debuff; repeat the same for the other Pyro. When they're both defeated, Red pinpoint Bowman and start attacking him until he's dead: if Hawkeye is lucky enough to shoot an Impact Arrow, Bowman class bonus won't be a problem. 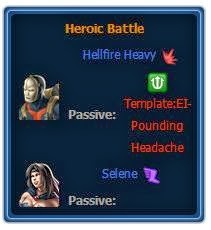 Sometimes, Hellfire Heavy dies first, and you have a 1-vs-1 with Selene. Don't panic. A good idea is Telekinesis-Recharge. You evade most attacks (expecially Skia Thanatou) and stun the Black Queen 50-75% of the time. When she's down to 5% health finish her with Psi-blast. If you have Phoenix at level 13, try her with basic uniform, with the Surprising Empowered ISO-8 for the Sympathetic Empowered ISO-8. The key in this battle is to manage counter-attacks effectively. Each of your characters has a unique counter-attack that will allow you to deal with the enemy's high health and more numerous attacks. Widow's counter is passive, giving you little control, but tends to leave Combo Setup and Marked for Revenge on enemies making excellent targets for Panther's Wakandan Arts. Wasp's counter requires opportunity debuffs (Effect Icon 009 Red Staggered, Distraction, Off-balance, Red Cornered, or Dizzy) active on their targets and does extra damage against Ultrons that have been hit by one of Panther's Vibranium attacks (L1 or L9). Panther's counter (and follow-up) requires some setup but will ultimately deal the most damage. 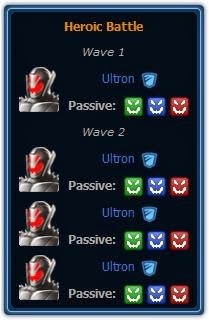 His L9 is especially good at dealing with melee resistant Ultrons, his L2 does excellent damage against Widow's leftovers, and his L1 works well against range resistant Ultrons. If possible use Panther Stance at the beginning of the second wave to gain both counters and follow-ups for as long as possible. 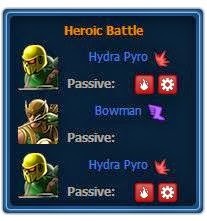 Keep Nimble on Wasp and Weakened on the Ultrons that act earliest while focusing down the one that acts last with Panther. Note that currently Wasp's L2 does not inflict Distraction, though it can be highly damaging. The easiest way to nail this one is by equipping Spiderman with his black suit and change his class to bruiser. 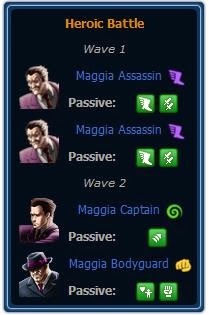 From there, fairly straightforward, particularly in round 2, where the Maggia Bodyguard can do some nasty damage to Black Cat. Got this from the forums... For the Phoenix HB, stock up on ATT / EVA ISOs, and socket the free EISO that allows you to heal while recharging. I got 31,000-something points using level 11 Classic Phoenix. to danielkeegan the hawkeye HB is easy just kill the 2 blaster then kill the fake hawkeye got only lvl 9 hawkeye no costume the iso-8 healing when recharging is not even that helpful i suggest you max hawkeyes damage and health and boom you can kill the first blaster with one shot.. done it in one run! and forgot to add they put some debuff on the enemy to make it easier..bowman gets a pincushion that make follow up attack do more damage! you can mindlink the enemy when you use the first ability in the blaster.. Thanks mate, i fought with her 12 times before i read ur comment. I won the fight right in the 1st attempt of changing the iso to att/eva. How the hell do you beat the Pheonix one. ok, i got it. firtst, blaster on the blaster, after that use him as shield with the mind. then you got it 50% done. For the Panther/Wasp/Widow Battle - You'll want to use the Grey Suit Tactician Widow for her counter-attack (35 CP). Panther's attacks will mostly concentrate on the THIRD acting Ultron - it will primarily consist of alternating his first and second attacks. Save the buff for the start of the second round. Wasp will want to use her third attack to gain nimble, and can alternate with the first attack on the THIRD ultron to blast it down. Widow's actions will primarily consist of using her second attack to apply Weakened to the First, then Second acting Ultrons - from there out, use her first attack for Combo Setup and go Super Ninja with Panther's Wakandan Arts to blast down the third. Counterattacks: Wasp's Opportunist (Weakened will help proc this), Widow's Revenge Tactics (Grey Suit) - Counterattacks Marked for Revenge targets just after she applies the debuff, Panther's Guile of the Panther (his third lv ability). As previously recommended, SAVE Panther's ability for the start of the second wave, when counterattacks will start to matter! Recommended Empowered ISO: Soothing Rest - which you can utilize after the first two Ultrons are blasted down. Mission 4 - Growing Pains fix the Heroic Battle !!!! of Phoenix !!! !